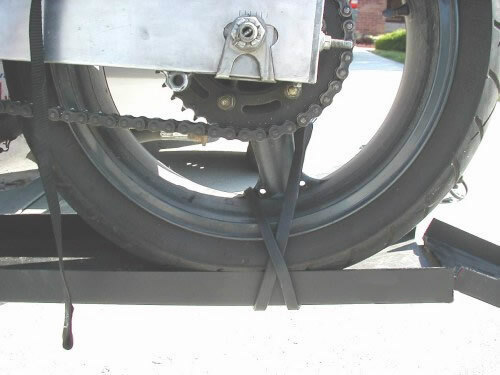 Tighten the tie-down belts to about 1/2 of the suspension travel. If you make them tighter, you can damage the seals. Use (1) tie-down from the left handlebar to the left carrier mount. Use (1) tie-down from the right handlebar to the right carrier mount. 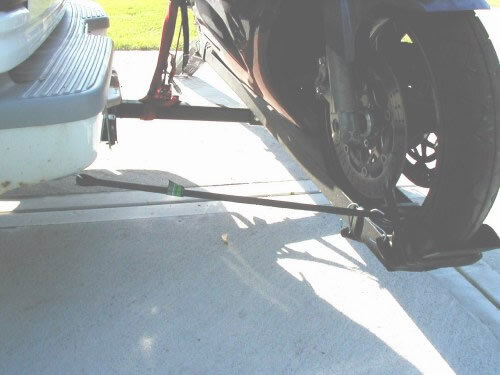 Use (1) tie-down from a high point on the left rear of the bike, like the fender / frame mount to the left carrier mount. Use (1) tie-down from a high point on the right rear of the bike, like the fender / frame mount to the right carrier mount. 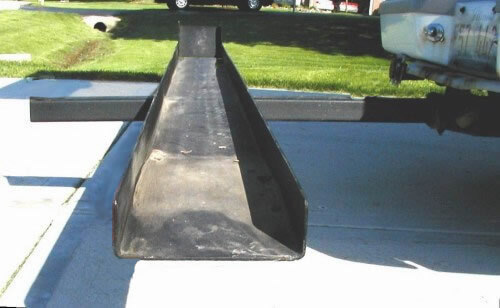 Tie down the front and rear wheels as shown in the pictures below. After all are secured, we suggest you get a roll of 2" wide gray duct tape. Tear off about a 12" piece and tape each open hook on the tie-downs closed, so if the suspension on the bike compressed more, and the belt had some slack in it, it could not come off. 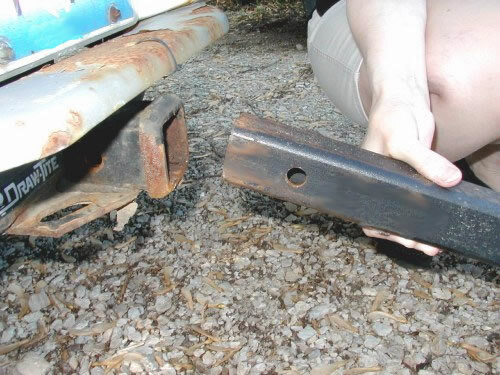 A locking pin for the hitch or a safety chain and padlock will discourage theft. When staying in a motel back in so the motorcycle is toward the building. Cover the motorcycle with a plain tarp, so a passer by cannot tell what is under the tarp. (out of sight out of mind) don't tempt thieves with a great view of your expensive motorcycle. Tie front wheel toward the front and down. Wrap tie down strap around the carrier, tire and wheel to make sure the wheel is secure. Carrier end note Heavy Duty thickness. 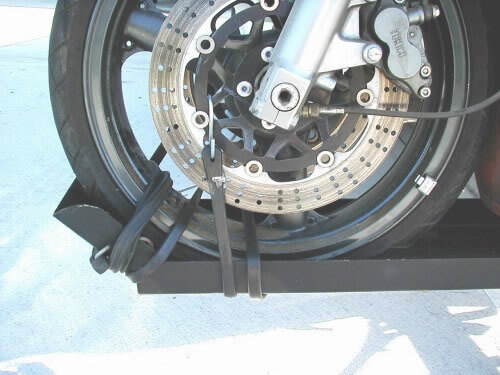 Front Wheel Ramp/chock, to help stabilize your bike. 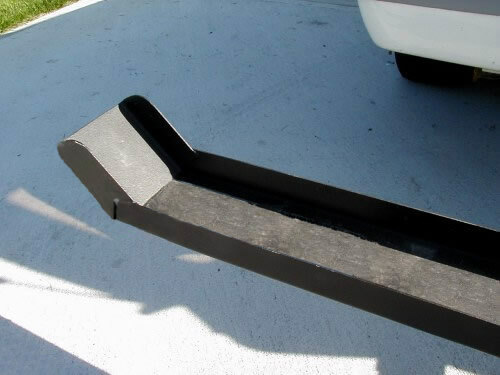 * Some carriers may come with 2 mounting pin holes to adjust for clearance of Spare tire . Use the 2nd mounting pin hole, allowing the carrier to slide further into the receiver, to get maximum strength, if clearance is not needed. 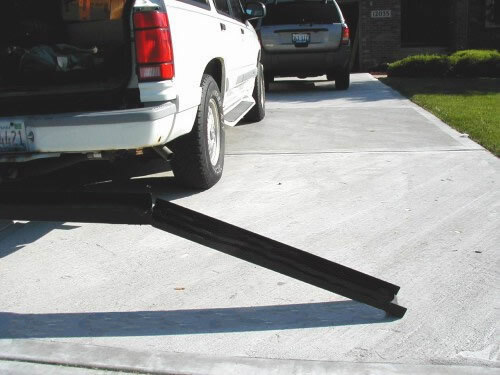 * An additional rubber tie down strap can be used between the drivers side rear bumper and the carrier to reduce the possibility of noise, or rattle.